The symposium will be held at the Hilton University of Florida Conference Center. 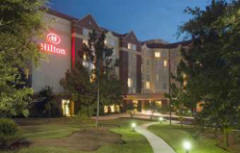 The Hilton University of Florida is offering participants a very special rate of $109.00 per night (plus applicable state and local taxes, currently 11%) for up to two people in a room. The group rate will be honored two days prior to and three days following the conference dates, based on availability. Reservations must be made by Friday, July 4, 2014 to guarantee the discounted group rate. The hotel offers a complimentary shuttle to the University of Florida, Shands Hospital at UF, and the Gainesville Regional Airport, based on availability. For more information on shuttle reservations, email Ms. Diana Benintend with the Hilton at dbenintend@hiltongainesvilleuf.com. The hotel is also pleased to offer complimentary self-parking for symposium attendees. Complimentary wireless internet will be available to symposium attendees in the meeting rooms. Internet access will be available in guest rooms for a reduced fee of $7.95 per day (regularly $9.95). You may also make your reservation over the phone by calling 1-800-445-8667 OR 352-371-3600. When making your reservation by phone, be sure to use the Group Code FFC814 and state that you are with the International Firefly Symposium in order to receive the reduced group rate. Reservations must be made by Friday, July 4, 2014 in order to guarantee this special group rate. Please be aware the block of rooms may fill before the deadline, so we urge you to make your reservation as soon as possible. After July 4th, the discounted rate is not guaranteed. Click Here for information about sharing hotel rooms.